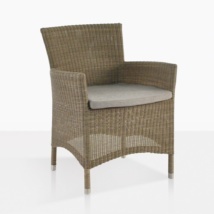 Get ready for comfort and serenity with the Romansa Wicker Dining Arm Chair in Kubu! 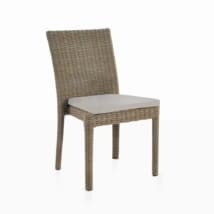 Part of our Romansa Collection which also features a side chair and comes in Java Brown as well as this Kubu Gray, the Romansa Wicker Dining Arm Chair (Kubu) is chic and sharp with long lines on a satisfyingly simple frame highlighting the attractiveness of the Viro® wicker. This terrific chair is 21 by 22 inches, with a slender arm that still enables the Romansa Wicker Dining Arm Chair (Kubu) to be stacked for easy storage! W22" x D23.5" x H35.5"
The Romansa Wicker Dining Arm Chair (Kubu) is made out of the best materials for outdoor use, starting with a strong, confident powder-coated aluminium frame ensuring you get a long lasting product that won’t corrode outdoors. 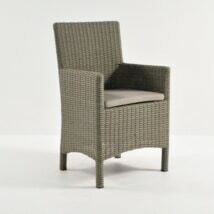 Wrapped elegantly around this simple frame is Viro® wicker in Kubu Gray, resulting in a long lasting, hard wearing and gorgeous looking product! Viro® is one of the best wickers for outdoor use – first and foremost, it is an award winning product, a company applauded for being eco-friendly and a product with such a good rating of longevity, you will be thrilled with your choice! Viro® is through dyed and treated against ultraviolet rays, we love using this tremendous product in our wicker dining chairs, relaxing chairs, loungers and deep seating! 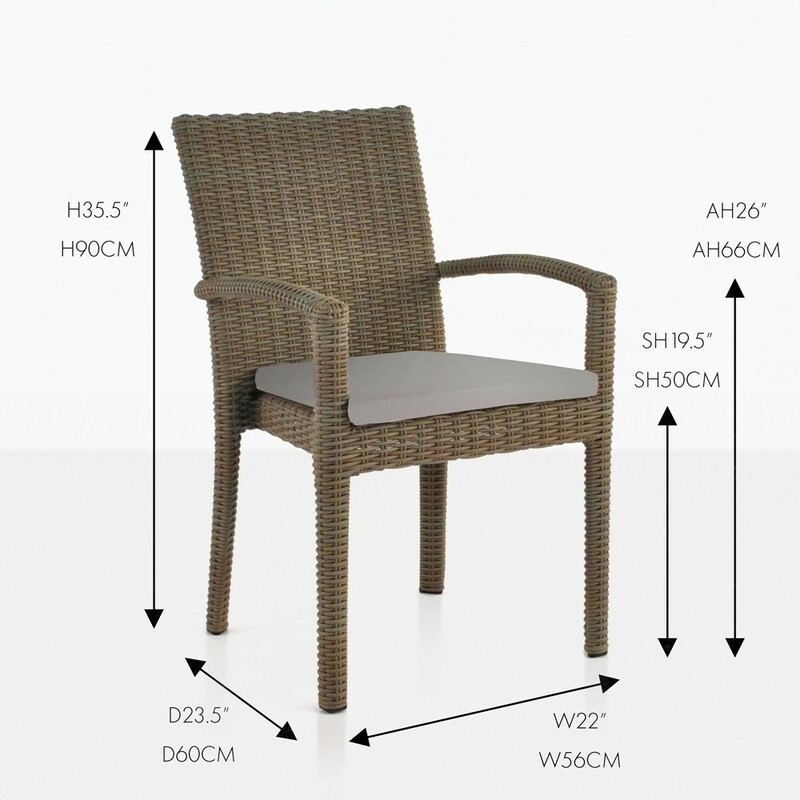 The Romansa Wicker Dining Arm Chair (Kubu) comes complete with a free Sunbrella® pad, so you are set to dine outdoors in style and without the worry of luxury items falling apart! All our furniture at Teak Warehouse is designed and built to combat extreme weather conditions, from our beautiful A-Grade Teak, to chunky Raw Concrete, Resin, Aluminium, Sunbrella® fabrics, Marine Grade #316 Stainless Steel, Batyline® and Textilene® mesh – all these products have been tried and tested for outdoor use. We are extremely proud to bring you these items at a fraction of the retail price! Whether you’re after a dining table and chairs or a divine deep seating collection, bar furniture for your patio, or sun loungers for poolside, we have everything you need! Do you have a modern home or apartment in need of a beautiful, structured dining space? Place your Romansa Wicker Dining Arm Chairs (Kubu) around one of our fabulous Raw Concrete Tables and dress the area with rustic pots and planters to create that concrete jungle feel that is so contemporary and fantastic! Like a formidable classic look? Place a Romansa Wicker Dining Arm Chair (Kubu) at each end of your A-Grade Teak Table and line the sides with the matching Romansa Side Chairs. We guarantee you’ll be thrilled with the cohesion of all these beautiful products. The Romansa Wicker Dining Arm Chair (Kubu) is a superb wicker chair for the commercial property, as it is super easy to clean, stacks and looks incredible in a courtyard setting. Need more information or want more ideas for designing the outdoor area of your dreams? Our sales staff are in store from 10am every day, we take pleasure in helping you find items that fulfil your desires and fit space requirements. Call us or email, we will provide you with a quote, complete with shipping. Wherever you may be located in the States, we ship there! 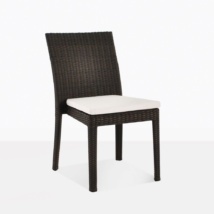 The Romansa Wicker Dining Arm Chair (Kubu) is a divine stacking chair which suits many different spaces.